The Federation of Islamic Organizations in Europe (FIOE) strongly condemns the irresponsible decision taken by the American president to eventually move the US embassy to Jerusalem, in a suspicious attempt to destroy the Arab and Islamic identity of the occupied city, and impose a fait accompli. The decision is an outright violation of the legitimate rights of the Palestinian people, confirmed by international resolutions, and a flagrant breach of the principles of international and humanitarian law as well as the relevant UN covenants. By so shocking the conscience of humankind, this reckless move has created an exceptional state of repression at all levels. In defiance of the sentiments of the Ummah, such decision disregards the eminence on which Jerusalem is situated as a symbol for both Muslims and Christians, which is a serious act of provocation that may bring further instability to this already volatile region. 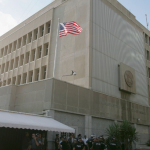 Palestinians in Europe Conference (PEC) expresses its shock and dismay over the news of potential American action to move the US embassy from Tel Aviv to Jerusalem. The step is irresponsible and against international law and the basic Palestinian rights, given that Jerusalem is the eternal capital of the Palestinian people. It can never be the capital for the occupying power Israel. PEC which represents thousands of Palestinians and European-Palestinian nationals refuse the American step and the way it treats such matter with reckless politics. The conference call on the European Union and European Governments to take serious measures to resist the American step which will put the region into another round of vicious conflict and bloodshed. Abou Rashed is also posting Arabic statements on the issue from the group known as Europeans for Al Quds (Europeans for Jerusalem) first identified by the GMBDW as tied to Hamas and the Global Muslim Brotherhood and which took responsibility for the wave of protests in Europe centered on recent Israeli actions at the Al Aqsa Mosque in Jerusalem. Meanwhile, the Hamas leader Ismail Haniyeh described the decision as “flagrant aggression” and warned of dire consequence. According to an Al Jazeera report:. December 6, 2017 Speaking to Al Jazeera from Gaza, Hamas leader Ismail Haniya described Trump’s decision as a “flagrant aggression”. “This decision is an uncalculated gamble that will know no limit to the Palestinian, Arab and Muslim reaction,” he said. Israeli media is further reporting that Hamas has called for a Palestinian “Day of Rage” on Friday. December 6, 2017 American President Donald Trump today announced his intention to move the US Embassy in Israel to Jerusalem and recognise the city as its capital. This proposed move shows a flagrant disregard for international law, Palestinian rights and international opinion, serving only to inflame tensions and unrest across the Middle East.